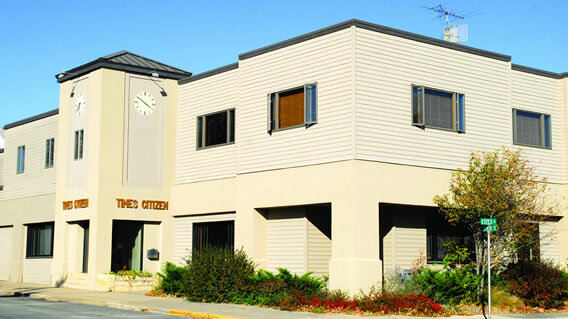 Times Citizen Communications is a privately-held media company headquartered in Iowa Falls, Iowa. Locally, it operates the Iowa Falls Times Citizen and Ackley World Journal newspapers and KIFG Radio. The history of the news media in Hardin County stretches back to the 19th century, when there were at least 16 newspapers in publication. One of the longest-tenured and most respected former publishers of the Iowa Falls Citizen, as it was known for many years, was Ira Nichols. He stayed for nearly 40 years before selling the newspaper in 1933. In 1948, Carl Hamilton bought controlling interest of the Iowa Falls Citizen. Later that year he purchased the Alden Times, creating the Times-Citizen. Hamilton remained at the paper until 1962. In 1983, Carl Hamilton’s son, Mark Hamilton purchased the Times-Citizen. Hamilton remains the owner today. Under his direction Times Citizen Communications, Inc. was formed. It encompasses the two newspapers, with both print and Internet delivery; a radio station; The Link, an electronic news delivery service; Media Marketing, which sells advertising for myriad farm publications; and a commercial printing operation. The Times Citizen and Ackley World Journal have won numerous state and national awards. The company prides itself on being a respected source for news and information while creating a sense of community among readers. © Copyright 2016, Times-Citizen Communications, Iowa Falls, IA.